TECH ALERT: Latest supported Java release. 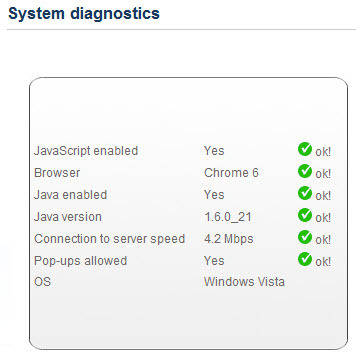 The new java version (build 1.6.0_31-b05) released as of 2/26/2012, is not supported by 3DXplorer, so please don’t install it. Many users of 3DXplorer Studio need to be reminded of the recommended resolutions of JPEG files which are used as a picture or a painting or even a texture in 3DXplorer. In general, like for any web development platform, you should keep your image resolutions as lowest as possible; an image should not exceed 512 pixels for the larger dimension. A dimension above 512 is considered as a high resolution and such images will be down scaled unless you specifically refuse it at upload time. But there is also a rule which can help you optimize drastically: Make sure your JPEG file (or PNG file) has the smallest resolution possible while keeping the larger dimension of the image with a number of pixels which is a power of 2 (ie: 16, 32, 64, 128, 512, 1024 or 2048). This means that a 40 x 64 image is well optimized because the larger side (64) is a power of 2. Similarly, an image with a resolution of 40 x 32 is not optimized because the larger side (40) is not a power of 2. What will happen if you don’t respect the above rule? Well, the real time rendering and the hardware acceleration algorithms used om most computers will be up to 3 times slower and require up to 300% more memory for providing the same visual quality. Same thing for the loading time of the scene which will be up to 3 or 4 times slower for equal visual quality. Example: Let’s assume you have reached the resolution of 80 x 42 after having optimized your image. You should know that if you reduce it to a 64 x 34 image you may save up to 300% in performance. Looking forward to your optimized scenes that your users will appreciate. You can now test your configuration here, before entering a 3DXplorer space! Although 3DXplorer is download-free and browser-based, it’s still a relatively sophisticated application: a real-time 3D engine including a multi-user environment with chat, VOIP, desktop sharing, remote control, and much more. As a result, it does require some system and network characteristics as presented here. After a period of successful test, this tool will be integrated into all standard logins to any 3DXplorer space. Feel free to try it now, and feedback on this post. A new release, numbered T5.4.00 is up today. As any release starting with “T” this is a test release and unless you select it for your space , it’s not going to be automatically active. You can now check the list of avatar models that you authorize to be used by your guests. We have increased the library of avatars including more junior and more casual looks than the business looks we used to have. We have also enriched the number of multi-ethnic models for the V300 category, commonly used in many spaces. So now the account owner can decide, depending on the purpose of the space, which models (casual, formal, …) are adapted to the space and authorize them by checking the model in the list. A default set of avatars are activated in any new space, but the account owner can change that list at any time. Once you save your list, then you’ll have to check for new avatars that we may add to the library in the future, as saved lists will not be automatically updated to avoid undesired avatar models in your space. This change is a result of our new packaging and pricing announced earlier this year (Q2/2010), and that’s regarding the free platform. As per our published product features account owners with no paid licenses can use the studio to create as many spaces as they wish and use the player to enter the space and see their creation and show it to other users, but the multi-user features, including avatars, chat, etc… require at least an Online Meeting subscription if not other subscriptions. With all the new features of moderated chat, private chat, VOIP and more, there is a lot of value in the 3D virtual lobby and Meet-in-3D application. The free platform enables free 3D immersive walk-through, as well as a free creation tool (The 3DXplorer Studio). Updated Trouble Shooting page, Bandwidth and System Requirements.